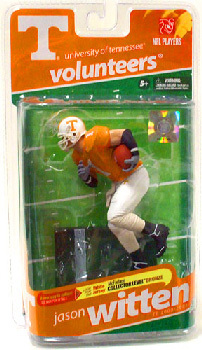 Description Of Item: College Football - Jason Witten - Tennessee Volunteers. The line will feature the incredible detail, signature poses, and picture-perfect facial likenesses that made McFarlane Toys famous with sports fans and collectors. This great set of College figures includes: Jason Witten, Eli Manning, Tony Romo, Marion Barber, Larry Fitzgerald, and Matt Ryan.